The infamous Kitchari Cleanse is an Ayurvedic must for the transitional seasons of the spring and fall. But what if your lifestyle is a bit too hectic for performing a full-on cleanse, or you are really feeling the need to cleanse during an “off” season such as the winter or summer? Have no fear, because like all things Ayurvedic we can simply make some modifications to adhere the cleanse to our current needs, making this one day a week kitchari fast a great option! Read more on the what, how and why of Kitchari here! A typical home kitchari cleanse is often an average of seven days and this doesn’t even include the vital pre-cleanse and post-cleanse schedule. Although the cleanse in itself is intelligently put together to flush the system without creating excessive depletion, a cleanse of any kind requires a large amount of our physical and mental energy. Therefore a major success factor will be to take as much downtime as possible throughout the entirety of the cleanse and for a few weeks to follow. Although this is lovely in theory, the reality for many of us taking off of work, travel or looking after your loved ones is simply out of the question. Whatever your reason, performing a one day a week kitchari fast is a gentle, safe and effective way to maintain the health of the system, increase the Agni (digestive fire), treat imbalance and disorder and (in time) establish optimal energy, vitality and overall quality of life. 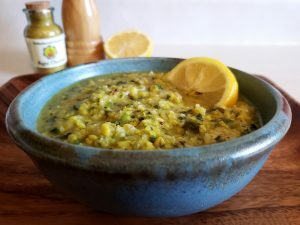 Eating a mono-diet of kitchari one day each week will provide a much needed break for the often overtaxed digestive fire, flushing out toxins and removing congestion and blockages from the vital channels of the body. This particular weekly cleanse contains the mono-kitchari diet for the day of the fast, but equally as important will also be some essential herbal remedies and self-care practices. Please keep this in mind, as you will need to plan out your day in order to fit in the recommended regimens. Like most things, the more you put into this weekly fast, the more you will reap its incredible health benefits! Although this weekly kitchari fast is much easier than performing a full-on cleanse, it still requires us to honor the general rules of a cleanse in order to get the most out of it. This means that we should be fairly strict with our meal routine and herbal schedule on these days. We should also honor the necessary rest that is needed during a cleanse of any kind by avoiding travel, excessive work, excessive exercise, excessive social activity, excessive talking and excessive technology on these days. Here are some other important factors to keep in mind when planning and performing this weekly kitchari fast. IMPORTANT NOTE: I am sharing a complete list of recommended activities for a weekly kitchari fast; however, modifications can be made as needed. Everyone’s schedule is different and while some individuals may be able to fit in the entire list of recommendations each week, others may find it to be too time consuming. Therefore the most important aspects will be to follow the mono-kitchari diet on the day of the fast and apply as many other recommendations listed as possible. This is not an all or nothing practice and even performing the mono-kitchari diet alone one day each week will be extremely beneficial for your health! Click here for a printable version of our Weekly Kitchari Fast chart. 1. Scrape the tongue each morning upon awakening. Scraping the tongue each morning will help to remove the dead bacteria and toxins that accumulate onto the tongue throughout the night. Indirectly it awakens the organs and stimulates the digestive fire. Directions: Using a downward scraping motion, scrape the tongue 7-10 times. Pitta and Vata types should use a stainless steel tongue scraper, Kapha types should use a copper tongue scraper. Purchase a Copper Tongue Scraper here. Purchase a Stainless Steel Tongue Scraper here. 2. Begin the day with 16 oz of hot lemon water. After the tongue is scraped and the teeth are clean, it is recommended to drink a 16 oz cup of hot lemon water. This will help to rehydrate the system, stimulate the bowels, flush out toxins and awaken the organs. The lemon provides some essential digestive enzymes and vitamin C. **Pitta types should use lime instead of lemon. 3. Take 1 Tbsp of Tikta Ghrita before food in the morning. Tikta Ghrita is a medicated ghee that is traditionally used during any Ayurvedic cleanse for lubricating the tissues to aid in the removal of deep rooted toxins. Taking this bitter ghee at a slightly larger dose will facilitate in the flushing and detoxification of the system on your fasting days. Directions: On the morning of your kitchari fast, take 1 Tbsp of Tikta Ghrita and melt it in 1/2 cup of hot water. Drink this on an empty stomach and wait at least 15-30 minutes before taking in your first bowl of kitchari. Hot water can be sipped on directly after as needed. **Alternatively, one can use Triphala Ghrita if Tikta Ghrita is too bitter or strong. Nasya is one of the five major cleansing practices in pancha karma as it helps to balance the mind and emotions and remove residual doshas from the system. Applying this on the day of the fast will promote healing of the mind, nervous system and emotions. Directions: Apply 3-5 drops of nasya oil into each nostril on the morning of the fast at least 30-60 minutes before food intake (fluids can still be taken). After the application, lay back with the head tilted for 3-5 minutes to allow complete absorption. 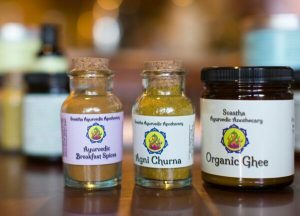 Some recommended nasya oils include Vacha Nasya or Soothing Sinus Nasya for Kapha types, Prana Nasya or Brahmi Ghee Nasya for Pitta, and Prana Nasya for Vata types. Purchase Soothing Sinus Nasya here. 5. Perform a short yoga or stretching session. Performing some gentle yoga or stretching will provide you with a solid foundation for the day of your kitchari fast. This practice will help get the blood flowing, remove obstructions, release stored emotions and reduce stress levels, making this a great complement to your fast! Directions: On the morning of your fast, before food intake, perform 20-30 minutes of yoga or stretching in a comfortable area of your home. Vata types will do best with a gentle or restorative practice using lots of bolsters and blankets and holding each pose for 2-3 minutes (such as supported forward fold, reclined butterfly pose and legs up the wall). Pitta types can do a restorative practice or a more active series such as our Detox Sequence. Kapha types should avoid gentle yoga and perform 10+ sun salutations, our Detox Sequence, or another similar more vigorous series. Discover our Detox Sequence here. **Alternatively, one can attend an appropriate yoga class at some point on the day of the fast if home yoga is not an option. Please use the guidelines above to choose the best class for your body type. 6. Apply a self-oil massage. 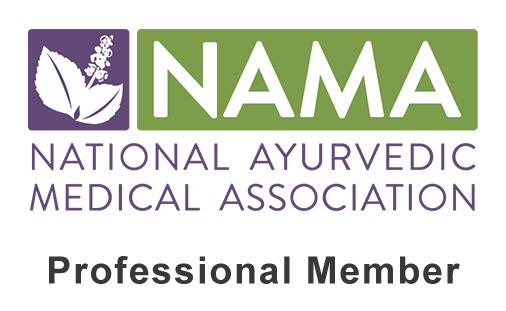 A self-oil massage known as abhyanga in Ayurvedic medicine is used for daily self-care as well as an essential practice for any and all Ayurvedic cleanses (called snehana or oiliation therapy). Massaging the medicated oil into the skin releases stored toxins from the tissues and allows them to be expelled from the system during the cleanse. As an added bonus, ahbyanga acts directly to strengthen and heal the nervous system, calming the mind, reducing stress and releasing stored emotions. Directions: Each morning of the fast, perform a full body self-oil massage using a medicated oil specific for your needs such as Vata Oil, Pitta Oil, Kapha Oil, Ashwagandha Oil or Bala Oil. The oil should be massaged in thoroughly and left on for a minimum of 30 minutes before taking a warm shower or bath. Get detailed instructions for the Ayurvedic Oil Massage here. Purchase a medicated massage oil here. 7. Make a large batch of cleansing kitchari to eat for breakfast, lunch and dinner. Since you are eating kitchari for three meals, it will be best to simply make a large batch to get you through the day. Here are some great kitchari recipe options that are more appropriate for times of cleansing. **See recommended meal times and suggested meal sizes in the chart above! 1. Take a walk after lunch. Although intense exercise is not recommended on the day of a fast, mild movement is highly beneficial. Taking a walk after lunch (the biggest meal of the day) is a great way to improve the digestion, get the blood flowing, relieve stress and take in some essential prana (aka fresh air) for the day. Directions: After lunch (or whenever time permits) take a 20-30 minute walk. Aim to walk alone to allow some reflection time and quieting of the mind. Avoid listening to music, talking on your phone or any similar activity. Observe your environment and listen to the noises that are going on around you. Make your walk a mediation in itself! 2. Drink a cleansing herbal tea between meals. 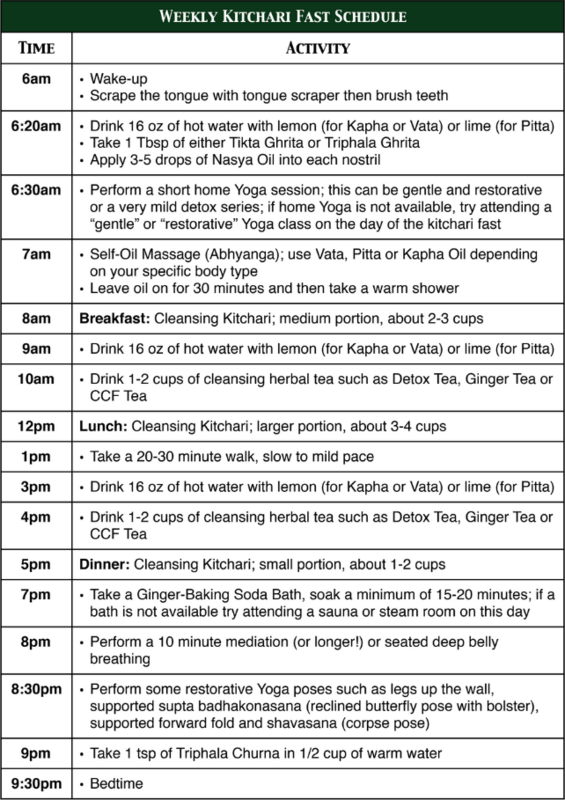 Directions: Drink 8-16 oz of the cleansing tea of choice between each meal on the day of the kitchari fast. It is recommended to make a large pot to drink off of throughout the day for easy access. 1. Take a hot ginger-baking soda bath before bed. Around 7pm, a wind-down period should begin. Taking a ginger-baking soda bath at this time will be a great way to finish up your day of detox and relax the mind and body even further. The ginger enhances the sweating potential of the bath and reduces pain and inflammation in the body. Taking this bath directly before bed will help to calm the mind, soothe the nervous system and promote a sound sleep for the night. Directions: Fill the tub with hot water and add in 1/2 cup of ginger powder and 1/2 cup of baking soda. Stir well until the powder has completely dissolved. Soak for a minimum of 15 minutes or until a sweat has broken. For added benefits add in a soothing essential oil such as lavender, rose or chamomile! Discover our Ginger Detox Bath recipe here. 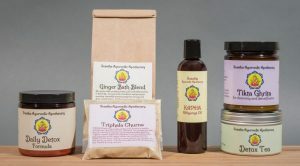 Purchase our Ginger Bath Blend here. 2. Perform a short 10 minute meditation. After the bath is complete, it is recommended to take 10 minutes to sit comfortably in meditation. You can utilize any meditation style or technique that you have been accustomed to, or simply try quieting the mind and focusing on deep belly breathing. 3. Perform a short session of restorative yoga. After the 10 minute meditation, continue this theme of restoration with 10-15 minutes of restorative yoga with postures such as “legs up the wall”, supported forward fold, reclined butterfly and/or shavasana (corpse) pose. Make sure to use as many props as needed and place a blanket on the ground and over you to allow full comfort, warmth and relaxation for the duration of the posture. Eye pillows are really nice for any reclined postures as well! 4. Take 1 tsp of Triphala Churna before bed. Triphala is an Ayurvedic must for times of cleansing. Taking a tsp before bed will help to flush out the GI tract, cleanse the blood and liver and promote a healthy bowel movement for the following morning. Directions: Mix 1 tsp of Triphala Churna in 1/2 cup of warm water. Steep for 3-5 minutes, stir well and drink. Follow with a few sips of plain warm water as needed. This should be taken 15-30 minutes before bed. Purchase our Tripahla Churna here. Read more on the health benefits of Triphala here. With a full day of restoration and detoxification, an early bedtime should be well received. Ideally one should be in bed by 9:30pm and asleep by 10 to allow the body time to integrate the healing process that occurs when cleansing. Take a detoxifying herbal formula such as our Daily Detox Formula or Trikatu Churna three times throughout the day before each meal. Perform a Dashamul Basti (herbal enema) the day of the cleanse (read more details on Basti therapy here). Keep up as many self-care practices as possible throughout the week such as tongue scraping, drinking hot water upon awakening, nasya and/or taking a walk after lunch. Continue with the Triphala Churna each night before bed (at 1/2 tsp nightly) and the Tikta Ghrita each morning upon awakening (at 1/2-1 tsp each morning). Make kitchari a staple in your daily diet! It is not just for cleansing, but a nourishing healthy meal with a wide variety of recipe options. A one day a week kitchari fast can be a great therapy for gentle detoxification of our body and continuous maintenance of our health. It is an effective way to reset our digestive fire each week, allowing it some rest and relaxation by honoring a simple diet, some complementary herbs and soothing practices. Although the recommended practices will undoubtably provides a more well-rounded and effective cleanse overall, they are not necessary as the mono-diet alone will bring you improved health and wellness. However, rest, relaxation and self-care are essential for the optimal health of our body and mind; so if and when possible, it is highly recommended to utilize a handful of these nourishing practices in order to get the most out of your weekly cleanse. In time you may even find yourself adopting some of these healing regimens into your daily routine!